HUNTS POINT — A local thrift shop sells brand-name merchandise at low prices by using an unconventional approach — the owners buy their merchandise at self-storage public auctions. Founded three years ago, Hunts Point Secondhand Merchandise at 745 Hunts Point Ave. sells secondhand items including clothing, toys, furniture, instruments and sneakers, all at significantly reduced prices. Handbags cost $2 to $5, sneakers run just $2 to $10 and a microwave goes for $25. James Diaz, 56, of Hunts Point, said he was surprised to find a stone garden bench at Hunts Point Secondhand for only $20, when a new bench would have cost him several hundred dollars. He said he was impressed by the auction strategy, about which The Hunts Point Express was first to report. Store manager Celestino Almonte, 52, buys items from auctions at multiple storage companies in the Bronx, including Safeguard Self Storage, CubeSmart Self Storage and Secure Self Storage. The store does not accept donations. The contents of entire storage units are sold for anywhere from $25 to $800, depending on the quality of the items. The goods put up for auction usually go for sale because tenants stopped paying for the units, Almonte said. “Storage is like rent that you have to pay for a room, and when they stop paying the rent for that room...the owner of the storage needs that room,” his assistant, Beatriz Ureña, added. 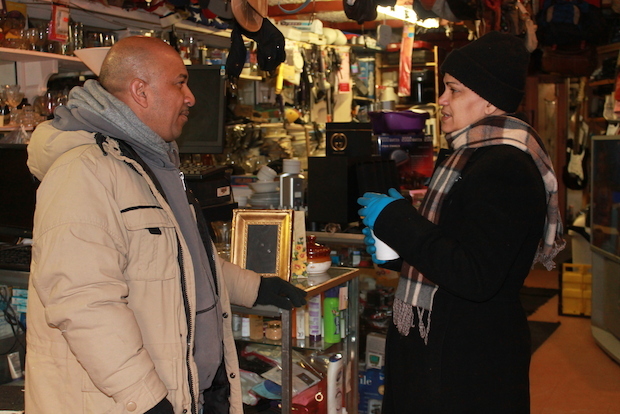 Hunts Point Secondhand digs through the units they decide to buy and brush up the items. These auctions are commonplace in the storage industry, according to CubeSmart Self Storage’s website. When Almonte recently attended an auction at U-Haul Moving and Storage at 138th Street and the Bruckner Expressway, he scored a Samsung dryer, washing machine, chair, shoes, toys, a radio, coats, sweaters and a television for one low price. “For a lot of stuff, I paid $750 for everything,” Almonte said. The low prices have drawn Hunts Point resident Anjanie George, 35, to Hunts Point Secondhand at least twice a month for the past year. "It’s more reasonable than other stores," she said.